Vijaya Ramaswamy is a professor with the Centre for Historical Studies, Jawaharlal Nehru University, New Delhi. She specializes in economic history, religion and society, and gender studies. Textiles is one of her key research areas. 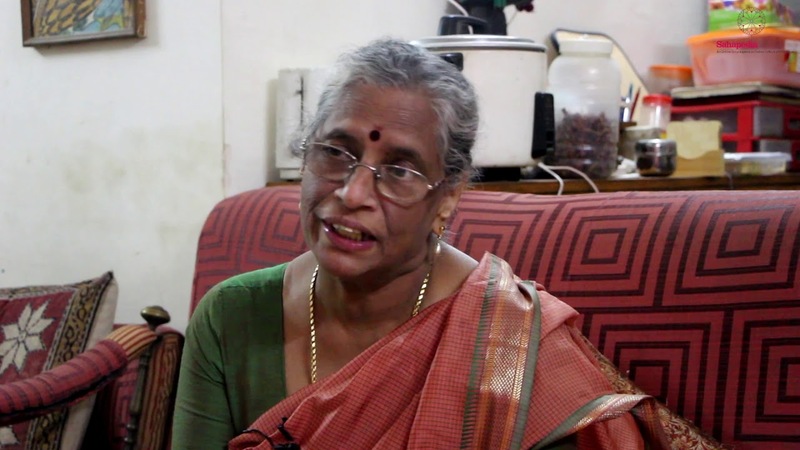 She has published several books including Textiles and Weavers in Medieval South India. In this conversation with Anirudh Raghavan, she talks about the earliest pieces of evidence for cotton and silk weaving in South India, specifically, the Kanchipuram region in Tamil Nadu. She traces the social and economic history of various weaving communities in Kanchipuram. The rise in the financial status of the weaving communities could be attributed to the royal patronage that they received in the Chola period, which later continued in the Vijayanagara period too. In fact, during the latter period, weaving guilds became very popular, several varieties of silk went in and out of fashion, and domestic markets and foreign trades expanded. Prof. Ramaswamy also talks about how in the 17th and 18th centuries, though the weavers fell into poverty, there were a few innovations with respect to their craft. At the time of the interview, Anirudh Raghavan worked as a research coordinator with Sahapedia. Anirudh Raghavan: Dr Ramaswamy, Kanjivaram silks (or Kanchipuram silks) are one of the most iconic handlooms in India. As with many handlooms, there is a sense of timelessness, a sense of unchanging antiquity that is associated with them. But as your extensive works have shown, Kanjivaram handlooms have been a product of several centuries of transformation and change. Could you tell us about some of the earliest evidences for silk and silk weaving in southern India, especially in the Tamil country? Vijaya Ramaswamy: Let me begin by answering your first question first. Silk weaving or sericulture is a latecomer in Tamil Nadu, especially in the Kanchipuram region. Traditionally, the region was known for its cotton weaving and not for silk. And if silk did come in, it was through the ports. So, that is something that you need to keep in mind. From the 10th century onwards, we find inscriptions of Uttama Chola [the Chola king who ruled between 970–985 CE] with references to weavers being part of the governance of the locality. There are four quarters inhabited by the Saliyar[i] weavers. It is a considerable number, which means they were not only producing for the locality but also going beyond that. There was also the Sengunthar community [another community of weavers], who during that period was called Kaikolars. The areas known for handloom weaving and textile production were those rich in black or red loamy soil, because it was not possible to have a stapling centre and production at one place and the production of raw cotton at another. These areas also had to be near a river because textiles need to be bleached. The Cheyyar River was supposed to be very good for the processing of the cloth. They used vandal mud [typical to Tamil Nadu] for treating the cloth. Because of the environment that was conducive to the presence of weavers, they congregated in Maduranthakam, Chengalpettu, and Kanchipuram—the region that was called Tondaimandalam. There is a Tamil saying: ‘Never live in a place inhabited by weavers.’ Because there was so much stench from the kind of dyeing and other handloom-related work they did and also, because they polluted the river. It was believed to be better to stay away from them, which is why they generally lived in clusters. They were never a part of the village community. But they wove textiles for the temple, and their reach was much beyond their immediate locality. They spread over to the place that eventually came to be called Sadarsapattinam. You have all these ports along Tondaimandalam, it is perhaps through them that raw silk arrived from Karnataka. There is evidence that pattu noolu (zari thread), the yarn, came from somewhere beyond through the ports. But the Tondaimandalam weavers produced the raw cotton. This is true for the area around Arani, and true for the country if you want to talk about the larger picture. It is certainly true about the area around Madurai, Uraiyur, Thanjavur and Tiruchirapalli. Weaving was happening wherever you had black soil or red loamy soil, wherever you had the circumstances spoken about. And if the weavers were not there, they were induced to come. The state or the royal patronage played a very important role in supporting the industry. It goes right back to the pre-Christian era. Let us just take [the case of] Uraiyur, which now, I think, is located in Tiruchirapalli district. I have been there. It is a very small town. But there was a time when it was a flourishing port town. It was a very important centre. It was, for a short while, the capital of the [early] Cholas. In the Roman times, it was known as Argaritic. Cloth was being exported from this region even at that time. So, much so that you have [Roman philosopher] Pliny the Elder lamenting, ‘The cloth of India is draining away the gold of Rome.’ It could be an aphorism but it is very clear that cloth was a major item of export from the southern coast. V.R. : The Devangas. They are very important. A.R. : Yes, the Devangas and Saurashtras. These are some of the important weaver communities. We see that all of these communities have a long history of weaving and they have come from various parts of peninsular India. Tell us a little about that and also about how they have shifted through history between silk and cotton in different ways. V.R. : There is no hard line between being cotton weavers and being silk weavers. The shift could depend on, let us say, the economic viability that they enjoyed. So the poorer weavers like the Thogata weavers or others, who are called the reserved category today, were also weavers but they would stick to coarse cloth production. The references to them come in inscriptions as early as [those from] the 13th or 14th century. It was not just the community of weavers that were involved in weaving, but there were other groups—marginal groups—as well. Among the Saliyars, there are the Pattusaliyars and the Padmasaliyars. Pattusaliyars clearly did silk weaving [pattu means silk]. Padmasaliyar is the community to which Nalli Kuppusami [who founded the famous Nalli Silks] belongs. So, today the Nalli silk empire is attributed to the Padmasaliyars who traditionally did not come from a silk weaving group. They shifted [from cotton to silk]. Today if I say, I am going to buy a Nalli, everyone understands that I am going to buy a silk sari. Silk has almost become synonymous with Nalli. The regions we spoke about earlier were originally cotton areas. It was because the British encouraged sericulture that some of these people took to silk weaving. In the interview that I did with Nalli Kuppusami for The Hindu, he says in his grandfather’s times they used to weave about 10 silk saris and then carry them as headloads to Mambalam [which was in the outskirts of Chennai then]. [ii] They did not even have proper ways of marketing. So, from Kanchipuram they carried the saris to areas like Mambalam and Mylapore. And then slowly the first Nalli House came up in the Mambalam-T Nagar area. Earlier, there used to be a lake in that area. It is a low-lying area, which is why it was affected by the 2012 tsunami. It was interesting to listen to Kuppusami’s recollections of his grandfather. These people were weaving. It goes back generations. Not all of them migrated. You must understand very clearly why people were foolish enough to migrate. We come from Kanyakumari. Now if there had been anything or any way in which my father could have sustained himself in that place, he would have stayed there. But there was nothing, there was no livelihood. So many weavers migrated due to what you now call the push and pull factors, which all of you are very familiar with. It could be the famine in an area or it could be temporary [shifting]. They migrated, and came back. For example, the Devanga weavers. You will find them in Karnataka, you will find them in Tamil Nadu. There is a variety [of silk] called Devangapattu. It is referred to in the 14th century Varna Ratnakara written by Jyotirishwar Thakura, and he came from the western coast. So, it is interesting that they did cotton and silk weaving, and [that] you find them in Karnataka too. There are Saliyars in Andhra and Saliyars in the Tamil country. Those who could migrate usually migrated in groups. Rarely do you find individual migrations. You would find relatives [separated and living in distant parts]. These days we have state boundaries. Then there were no boundaries, you had large kingdoms. Particularly, for artisans, craftsmen, merchants, there were no boundaries. They were welcome everywhere. In fact, the state [kings] used to induce them to migrate. That takes us to the pull factor because they knew that textiles were a major commodity not only for the local but also for the external market. So the Cholas, the Vijayanagara kings, all would encourage people [weavers] to come to their lands, weave for the temple, weave for the court and weave for a foreign market which was rapidly expanding. They would be induced to come in and settle but not with coercion, which is what the British and the Dutch did—they coerced the weavers to move into Black Towns [peripheral areas of major towns where the colonisers kept their craftsmen and weavers]. So, even migration can be of two kinds. Being forcibly colonised like the Russians did with Siberia is one kind of movement. The other kind of movement is when people go voluntarily. They settle down and they are so happy in the new place, they do not go back. The point of arrival remains the home. There is no return. But some people may still return. There were various ways in which these people moved and for various reasons. During famines, wars, diseases, the contagious diseases that usually came with famine and floods, they would move. But they would also move for state patronage. A.R. : If we talk about the economic status of the weaver, especially in the Chola period, would it be right to say that the weaver, particularly in the Tamil country, was prosperous in some ways. Would you go as far as to say that they were in fact prosperous, if so why? V.R. : The answer to that would be no. There is a very beautiful statement, I think, by a Turkish merchant, he says ‘great and small were merchants.’ Similarly, great and small were weavers. Some were very poor. They did not go up in the social scale or make much money to improve their economic position. However, there were also those who did. So, this does not really happen in the Chola period because in the 11th and 12th centuries, if you see inscriptions, you find references to therus[iii] like Saliyar theru. But they were not really what you would call ullale or within. They were usually porambadi or outside. If you have seen any of these temples, you must have noticed that they have got these radiating streets. So, some are closer to the temple and some are further and some are absolutely on the outskirts [for outcastes] like the Sudigadu or the Paraiyars and so on. Gradually, many of these artisanal groups moved inward, nearer to the temples, which means that from a position of not being very economically prosperous and socially dominant… [they slowly rose, economically and socially] At some point during the 15th–16th century, they came to occupy important positions, but, as I said, not all of them. In the 14th–15th century, there was a lot of conflict and some of it was because of temple urbanisation. This is a major factor. Temple urbanism [was for] those who were enterprising enough or were willing to move for a wider clientele. They had the temple and when you say the temple, it was a temple town. It is an urban settlement ultimately. Then you had the court, you have the nobility, you have the upper caste, upper class everywhere. It could be officials to whom they [weavers] were catering to. Then, eventually, you also had the market that went outside the temple town. Therefore, you had port towns, which usually connected with these kingdoms. The point I am trying to make is that during the Chola period, the change was slowly beginning but by the time we come to Vijayanagara, they [weavers] were fairly prosperous. That was when the weaver guilds became extremely popular. A.R. : So if we focus specifically on the Vijayanagara period, there is, as you have mentioned in your works as well, an increase especially in the demand for very fine varieties of textiles and that gives an impetus to the textile industry and the weavers. Why is that? Could you also tell us what are some of the unique varieties of textiles that came out during the Vijayanagara period because of this expansion of demand? V.R. : The expansion was twofold. It was also essentially because the nobility, the merchants and the richer groups within the country were beginning to assume fashions, sartorial fashions, which called for finer varieties of textiles, cottons, and probably even silks. This was also happening at the court level. But why? One very strong reason is the Islamic influence. There were the Ottoman Empire and the Persian Empire, both slightly different in their approaches but more or less what you call the Islamic world. The scholars call the process ‘cultural Islamisation’. It does not mean that Vijayanagara accepted the Islamic hegemony or sovereignty but culturally there was lot of mixing. In fact, if you look at Vijayanagara architecture, if you look at its cuisine, and now we are talking about sartorial habits, you will find that it is entirely Indo-Islamic. Wagner [Kim Wagner] has written about the kulla and the kabahi, the coat and the cap which they wore. The ridiculous thing is that the climate in Vijayanagara was not really conducive to heavy clothing. If you look at Abdur Razzaq’s writings in the 14th century, he says that the king virtually wears no clothes. He says the man is half naked, he is just wearing a langoti [loin cloth]. This is according to Razzaq. But by the time we come to Domingo Paes and Fernao Nuniz, you will find that Nuniz says the king Achyut Raya [1529–42] changes his clothes every day. Now, given that the climate is sultry and they do not really need those heavy clothes, why are they suddenly wearing these elaborate embroidered coats? You asked me a question about the new varieties [of textiles]. You have mashru, himroo, kotni, jamawar and jamdani. You have so many new varieties coming in, many of them silk either or cotton. So, why do they need these kind of clothes in a weather that is not really conducive to wearing them? The answer is actually because of changing fashions. It is fashionable to have an elaborate silk coat. You will also find another term—‘social Sanskritisation’—that I have used in one of my essays. The merchants and the upper class who traditionally wore only dhotis [or mundu] suddenly started aping the court manners. So, the more elaborate the clothes you wore, the closer you were seen to the court and the prevailing fashions. That is how silk comes in. Silk is seen as a symbol of elegance, affluence, power and pomp. Because of this there is an increase in the kind of silks that come in. There are a couple of inscriptions [from the Vijayanagara period] which I can refer to. For instance, you have reference to dasuripattu, which is most probably tassore [tussar silk]. There is mention of tassore even earlier but from this time onwards, it becomes very important. There is pattavalipattu which, in my opinion, is the patola variety—tie-dyed silk cloth. There is also a mention of something called konkanipattu. One does not know what that is. You find several new varieties of silks. Most importantly, there is something called chinapattu, Chinese silk, which was becoming popular for the same reason that Chinese products have become popular today. They were throwing the others out of the market by selling cheap. Those who could not afford the kind of silk that the king of Vijayanagara wore would get the cheaper Chinese silk. Reference to this is found in [the Portuguese apothecary] Tome Pires’s writings. He talks about silk coming in large quantities. You have all these silks in the market. You have inferior silk, you have superior silk. Goa became a major centre for the export of silk textiles. You look at the custom records and see how much silk was coming in. A.R. : If we talk of trade in textiles, you have said that during the Vijayanagara period Indian textiles were traded widely. There is a wide arch of trading to Malay Peninsula, even reaching Europe. So could you tell us how important is foreign trade to this industry during this period? And how was this trade organised? What is the structure of the trade and the role of the merchants in organising this extensive foreign trade? V.R. : I have told you there was, very clearly, a growing domestic market. We cannot undermine that. But also because of the changes that were happening in Europe, there was an explosion of foreign market. There is one trade [route] which went through the Malacca, Tenasserim, that is south Asia. In the process what happened is [that] batik cloth moved either from Indonesia into India or from India into Indonesia. Coromandel cloth [the cotton cloth for which the Coromandel region was famous in the 17th century], and sometimes spices, went to those areas. Very often it was part of a triangular spice trade. So, cloth became important from the 15th–16th century as part of the triangular spice trade. It was also important as an object of import substitution. [During that period] Spanish cambric (fabric) and silk were becoming very, very expensive. The tapestry from Flanders had become very expensive. They [the colonisers] found that Indian textiles could match them, and they were also much cheaper. So, all the East India companies kind of converged on Coromandel textiles. This is the period when Indian cotton became king because it was substituting for European textiles, finding new markets. It became a crucial player in the triangular spice trade. You also had a triangular textile trade where Coromandel textiles were going to South Africa. Sometimes the cloth was used to buy slaves and sometimes it was to clothe the slaves. I am not quite sure about this, but there was one particular cloth—blue salempuri—which was called slave cloth. Maybe it was used as an identifier of people who had been sold into slavery. Interestingly, today in places like Nigeria, Indian textiles are worn on ceremonial occasions, on ritual occasions and, especially, on rites of passage. How did that happen? It did not just remain slave cloth, it became something more in that part of the world. In terms of organisation, there are about 27 local fairs (santhe) mentioned in an inscription from Karnataka. The local merchants would bring their textiles there and it could be a face-to-face between the buyer and the seller. At some point, you have the nagarams (towns) where you have intermediaries who come, buy the cloth and then find a wider market for them. But when it comes to international trade, crossing the boundaries, the Indian Ocean trade, then you have these very strong commercial corporate organisations. I refrain from calling them guilds because they did not have a guild system though essentially organisations of certain communities like the Saliyar Samayam promoted production and sale of textiles. Among them, you had sale chettis, who would coordinate the process of buying the cloth at both horizontal and vertical level. If you look at the tax structure, you will find that there are taxes on cotton and dyeing. And all of these were controlled by organisations. It could be the Tisaiayirattu, which was a very important organisation from Karnataka but also had its stronghold over Tamil Nadu and Andhra [Pradesh]. There was Manigramattar which originated in Tamil Nadu and stretched to Kerala. You also had Padinezhavishayatar [another similar organisation], which only had chillai chettis, merchants specialising strictly in textile trade. They would not touch any other product. You had merchants who would engage in various trades, but there were specialists like chillai chettis and kudrai (horse) chettis. Horse trade again was specialised in the hands of certain ‘corporate guilds’, if you like to use the word, but I would keep that (the word guild) within quotes. A.R. : The figure of the master weaver comes up sometime during the Vijayanagara period and becomes significant to the industry, in organising of trade and process of production. What is the significance of the master weaver, and why is it important to Indian historiography to recognise that the master weaver plays a significant role in the textile industry during this period? V.R. : I think it is very important, especially because the British orientalist flattened the Indian economic landscape. To them, all weavers were the same. What I am trying to say is that weavers are big and small. There were weavers who did coarse cloth weaving, there were weavers who did silk weaving. And among them there could be a small weaver with [just] two looms and there could be a weaver with 56 looms, a chetti—a sale chetti or a kaikola chetti—who was, therefore, a master weaver. This you find in various sources of Vijayanagara history. There are plenty of mentions in the Vijayanagara local records and inscriptions. But it becomes more crucial when you reach the East India Company period because then the master weavers were playing a double role. They were trying to save their own skin. They were not taking risks, they were beginning to act as comprador for the East Indian Companies. The term that they use in the records is kharidars. That is when they become the hated [people]. The weavers begin to hate these master weavers. If you look at the Barah Mahal[iv] records, they refer to this intense dislike because they [the master weavers] were acting at the behest of the East India Company. They were making them work according to the musters, specific patterns set by the Company. They would say, we do not want reds and blues, we want browns and greys which are the colours popular abroad. The master weaver would hand out advances. I think this is a very important issue. How gradually over a period of 300 years the weavers moved from the kind of corporate entity that they had, enjoying power and splendour, to becoming minions of the British, and the master weavers turning comprador to some extent. Some of them did fight. You still had some independent merchants and some independent master weavers, but by and large they took the easy road. And [then there is] the fact that many of them moved into the Black Towns. You were alienated from your home and thrown into a different work environment. You also lost a lot of your independence and were working to musters of previously supplied patterns. I told you earlier that a guild was a community organisation, where members supported each other. If there was a wedding, the community would come forward to provide money. Since all that was broken [in the period of the British rule], the weavers would get into debt, and in order to settle their debts, they would take advances and weave to advances. They completely lost their initiative and were producing [what their masters dictated]. Textile scholar John Irwin, in a work of his, quotes a letter: This man [a particular weaver] has produced this but there are errors, so discard the entire lot, do not buy it. So, what does the weaver do? Where does he dump it? Earlier, it would not have been seen as an error but a product of your imagination, however asymmetric it was. But asymmetry was not tolerated by the East India Company and the result was their [weavers’] products would either be unsold, undersold or dumped. A.R. : If we talk about the period of the European encounter with the various East India companies and then later in the 18th century as well, there has been a lot that has been written about the history of industrialisation. Like how the weaver falls into a period of poverty. But could you also locate signs of vitality among the weaving community during this period? Do you think there were innovations that took place during the late 17th–18th centuries that could be considered remarkable? V.R. : You know jacquard was not really the great invention that it is made out to be nor was spinning genie. All the time there were these minor innovations that were taking place. And there were innovations by the weavers themselves, very often by a stroke of serendipity. You have the jaala, you have the adai, these are all variations of the jacquard. For instance, silk cotton weaving required a certain skill. The kind of jamdani silk that was produced required a certain skill. There is an inscription from 1538, from Tirupati or Kalahasti during the period of Achyuta Raya, which mentions a group of Muslim weavers in Tirupati have found a new way of weaving. So, the state is going to give them tax exemption, will give them housing sites, and any Hindu weaver who imitates them will be fined 12 varahas [gold coins used during the Vijayanagara rule]. Tremendous innovations were happening all the time. This continues right till the mid-17th century because the Cotton Revolution had not yet taken place in England. But from 1750 onwards, you have the Agrarian Revolution followed by the Cotton Revolution, then you have the mills of Manchester and Lancashire, and there is a complete reversal. India begins to produce raw cotton and the British are no longer interested in the weavers. After that there are no silver linings, the story is rather sad. A.R. : So, if you talk about the Kanjivaram silk industry and what is popularly called the Kanjivaram, the gold zari and the silk weaving that comes from that region, what would you say is the antiquity specifically of Kanchipuram sari? V.R. : Others might have written on this but my take is that before the late 19th century, the Kanjivaram silk sari did not exist. So, when you say the Kanchipuram brand, it was not there before the 19th century. There were a lot of changes that happened in the zari as well. Initially, silver [used in zari-making] was coming from Surat and silver zari was being used. Then they started importing from cheaper places. Something absolutely fake was coming from countries like China and, especially, Japan. Today, what goes by the name of Kanchipuram zari is not authentic at all. The colours are not authentic but it now has brand value. In fact, Nalli Kupuswami told me, please do not buy our greens and our peacock blues and colours like that because they will run [fade]. [v] You can keep that in mind, next time you go shopping for a Kanchipuram. There is nothing authentic. What is lost? I think you need to go back to what you call culture care which people like Dastkar[vi] are doing. Go back to cottons and, yes, even the silk that they weave. I will share a very interesting story with you. This happened in Bangalore. I had been studying silk [and cotton] for about 20 years by then, so I could make out whether it was 100 counts or 80 counts by looking at the textiles. The Bangalore weavers thought that I was a university product who knew nothing about cloth. They placed two kinds of identical sarees [in front of me], one was a power loom and it had a lot of art silk. What they do is they have three silken threads and two art silk, which is very, very cheap. Art silk is not silk at all. It is filature silk, which is how it gets that sheen. The moment you have that sheen, it is suspect. After about two to three minutes of feeling it, I could identify which one was the power loom and which was the handloom. These are things that one has to look out for. Authenticity is lost because culture care is lost. And culture care is lost because we consumers are responsible. We want cheap and the best. Reduce the prices and give us a Kanchipuram. The Kanchipuram we get at Rs 2000 will be artificial silk, art silk mixed with pure silk, or you will get all kinds of weak dyes and Japanese zari. So, somewhere we have compromised on culture care. [iii] Therus are streets where people from a particular community reside. [iv] The area made up of Salem, Hosur, Dharmapuri, and Krishnagiri, which were part of the Vijayanagara kingdom.